The birth of a child should be a joyous event in a parent's life, but unfortunately labor can be long and complicated, and sometimes babies suffer birth injuries during labor, altering the course of their lives. Birth injuries are often caused by a health care professional's negligence. One type of birth injury with devastating long-term consequences is cerebral palsy. This is the medical term for a group of neurological disorders that affect movement and cause disability, cognitive impairment, and sometimes epilepsy as well. At Moll Law Group, our birth injury lawyers are available to help you pursue compensation if your child suffers from cerebral palsy. As experienced Chicago cerebral palsy lawyers, we understand that these disorders arise due to a lack of oxygen flow to a baby's brain during the labor process, although other factors may affect the development of the disorder. Most children with cerebral palsy suffer from it from birth. Often, cerebral palsy causes musculoskeletal issues, as well as problems with fine motor coordination, balance, and walking. 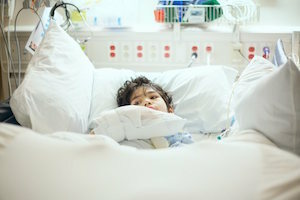 Some common medical errors that may lead to cerebral palsy include a failure to properly treat infections during the mother's pregnancy, a failure to schedule a Cesarean section even though a baby is too large to get through the birth canal, a failure to appropriately monitor fetal heart rate, and negligence while using a vacuum or forceps during the baby's delivery. In order to win a birth injury case, you need to prove the following elements: the standard of care that the health care professional should have followed, a breach of the standard of care, a birth injury, causation, and damages. Basically, you need to show that it is more likely than not that but for a health care professional's breach of the appropriate standard of care, your child would not have developed cerebral palsy. In many cases, it may be necessary for a cerebral palsy attorney at our Chicago firm to consult a nurse or other medical professional and closely examine your medical records in order to determine whether it is likely that medical negligence, as opposed to some other factor (such as genetics), caused your child's condition. If you establish liability, the damages in each case are usually based on how severe your child's cerebral palsy is. Some children suffer so badly from cerebral palsy that they need to be cared for over the course of their lifetimes, and they may incur millions of dollars in costs of care. However, there are also children with milder cerebral palsy who may not need such extensive care. In most cases, you can seek to recover compensation for your child's medical costs, rehabilitation, physical therapy, counseling, special education, home care, supplies, and pain and suffering. No parent anticipates incurring millions of dollars in expenses while caring for a child who suffers from disabilities due to the errors of a doctor, nurse, or hospital. If your child developed cerebral palsy, and you suspect that it was because of a health care professional's negligence, the Chicago cerebral palsy attorneys at Moll Law Group are available to help you pursue compensation. Our firm represents families in Wheaton, Schaumburg, Naperville, and throughout Cook County. Billions of dollars have been recovered in cases in which we have been involved. Call us at 312-462-1700 or complete our online form to schedule a free consultation with a medical malpractice attorney.